At the top of this skyscape, Centaurus A (NGC 5128) seems to be a fantastic jumble of old yellow stars, young blue star clusters, and imposing dark dust lanes. Spanning over 60,000 light-years, the peculiar elliptical galaxy is apparently the result of a collision of two otherwise normal galaxies. The left over cosmic debris is steadily being consumed by a black hole with a billion times the mass of the Sun which lies at the center of Centaurus A. It's likely that such black hole central engines generate the radio, X-ray, and gamma-ray energy radiated by Centaurus A and other active galaxies. For an active galaxy Centaurus A is close, a mere 10 million light-years away, and is well-studied by earthbound astronomers. At the bottom of this image, globular star cluster Omega Centauri (NGC 5139) is some 15,000 light-years away and 150 light-years in diameter. Packed with about 10 million stars much older than the Sun, Omega Cen is the largest of 200 or so known globular clusters that roam the halo of our Milky Way galaxy. 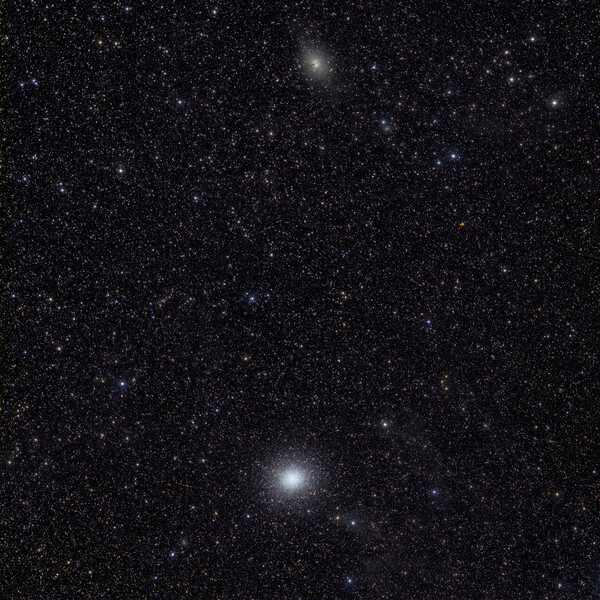 Though most star clusters consist of stars with the same age and composition, the enigmatic Omega Cen exhibits the presence of different stellar populations with a spread of ages and chemical abundances. In fact, Omega Cen may be the remnant core of a small galaxy merging with the Milky Way (text adapted from APOD).